This quantitative measurement tool for improving financial performance, is written by Stuart Ferguson. Integration difficulty - or "culture clash" - is the most-cited reason for M&A failures. 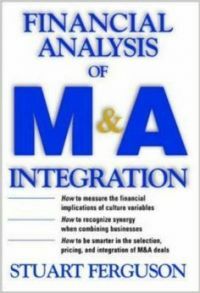 "Financial Analysis of M&A Integration" provides an innovative tool for quantitatively anticipating and preventing functional problems when combining companies and their disparate cultures. This dramatic new approach will help decision-makers measure the direct impact of behavioral concepts data on ROI, cost of sales, and other business ratios and indicators as they factor the financial impact of cultural differences into valuation, shorten the integration period, and reduce its related costs, and more. Stuart Ferguson, Ph.D., is the founder of Organization Change Resources, a consultancy that focuses on issues from culture assessment and development to organizational change, strategic planning, and team building for such firms as Marriott, Merrill Lynch, MetLife, and others. Formerly a vice president of global financial services at the American Re-Insurance Company, Dr. Ferguson is a frequent speaker at conferences both in the United States and around the world.